Landscape Plants come in shapes, sizes and colors so numerous it is hard to say how many different plants there are for you to use. What makes a landscape interesting is to use a variety of plants that blend well together. Plant low growing plants under small trees like you see here with Ice Plant (the pink flowering groundcover) growing under the Weeping Japanese Maple. Use tall, evergreen plants like the Japanese Cryptomeria and Ligustrum along a property line to insure privacy. The tall Southern Magnolia behind the fence frames the house from the street and adds privacy and beautiful white summer flowers to the view from the back yard. This stone retaining wall is a gorgeous structure, but does not become a truly integrated part of the property without adding landscape plants. 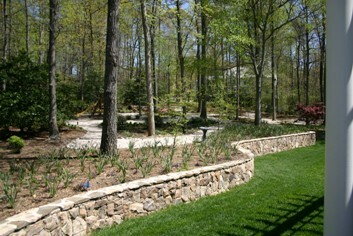 The daffodils directly behind the wall provide a sweep of spring flower color and green foliage before the ferns push through the ground to make a soft woodland cover for the summer. 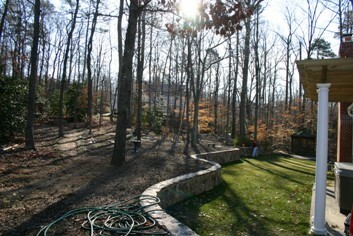 Landscape plants of different heights and flower color are used here to create a natural looking woodland. Native American Holly is the evergreen tree giving an intermediate height. An added bonus is the red berries that are attractive in the garden and for birds to eat. Azaleas and Rhododendron are two of the flowering evergreen shrubs that add color at various times during the spring and thrive in this setting. Select plants that you like, but they must also grow well in your area. Learn what hardiness zone you live in. Landscape plants are classified according to hardiness zone, so this information tells you in what areas of your country they will flourish. Learn about a plant’s physical characteristics such as mature height and width; leaf color and type; flower color and time of bloom; and rate of growth during the design phase. Shrubs can be fairly easily transplanted, if they do not meet your expectations. 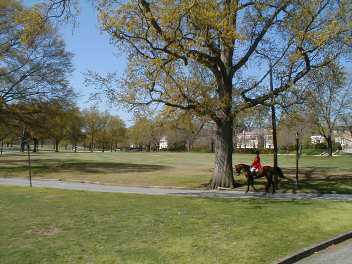 On the other hand, mature trees that have been planted in the wrong place can be expensive to remove. The Manual of Woody Landscape Plants by Michael Dirr is a reference book used by many professional landscape designers. It is a thorough guide to thousands of trees and shrubs. Large deciduous trees (75’-100’ tall) like oaks and maples give shade, create a canopy and add height to the landscape. Their strong branches add interest in the winter. The fresh new leaves emerging in the spring herald in the warm weather and a season most folks find exhilerating. Their fall color brightens the autumn sky. 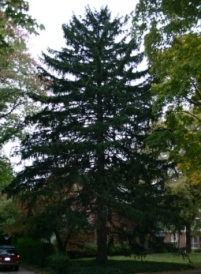 Evergreen trees like this Norway Spruce are a welcome addition to the landscape at any time of year, but especially in the winter. 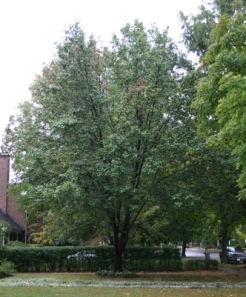 Medium size trees like this Bradford pear give intermediate height (40’-50’ tall) and usually have an interesting characteristic like peeling bark or abundant spring flowers. 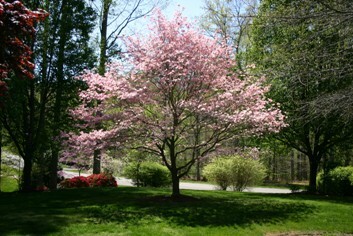 This tree is one of the first trees to bloom in the spring covering itself with white flowers. It is particularly showy because it flowers before the leaves come out. There are some new varieties like Aristocrat and Chanticleer that have a narrower growing habit and their branches do not break as easily. 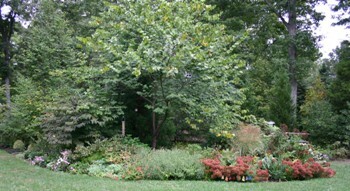 Notice the taller Sugar Maple beside the Bradford Pear. The intermediate height tree makes a nice transition from the street to this person's front yard. Small ornamental trees (15’-20’ tall) like dogwood and crape myrtle give us beautiful flowers and a shade that is lower to the ground than the large trees. Becasue of their size, it is easier to use them close to the house to soften a corner or to create a nice view from a window. Evergreen shrubs can be soft and flowering as seen here with a rhododendron and viburnum or stiff and bristly like holly and conifers. Deciduous shrubs like Harry Lauder Walking Stick have interesting branches. Forsythia and quince have showy spring flowers that bloom before the leaves come out. Roses fill the garden with color in the late spring and summer. In Virginia, they even bloom again in October. 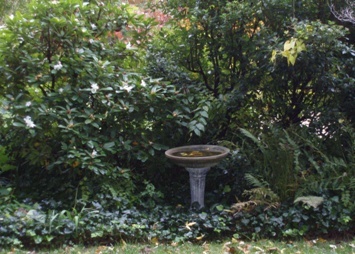 Dwarf shrubs (1’-2’ tall) can be planted in front of other plants to create a cascading effect or fill a bed under a tree. 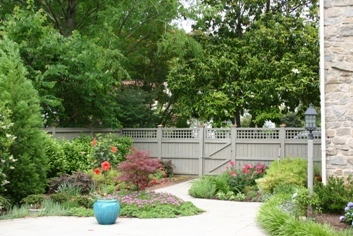 Trees and shrubs make up a large part of the palette that is used to design your landscape. However, there are many more plants to add color and texture at the ground level. 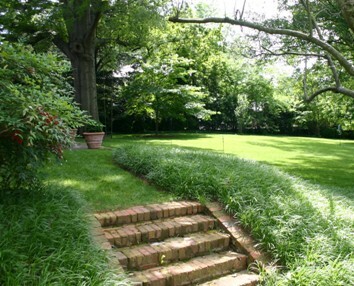 Groundcovers are deciduous or evergreen plants like the lirope spicata that is growing beside the steps in this photograph. They are only a few inches tall and literally cover the ground in mass. There are numerous varieties of daffodil, tulip, hyacinth and crocus bulbs in a variety of color combinations not to mention other not so well known bulbs like camassia (a tall, blue flower). Iris and peonies grow from tubers. 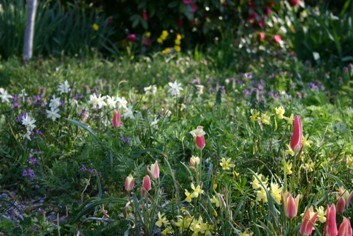 Again, a wide range of colors and flowering times are available. Perennials give a blast of flower color during the growing season. The burgundy flower of the Autumn Joy Sedum develops in the fall and butterflys love it! 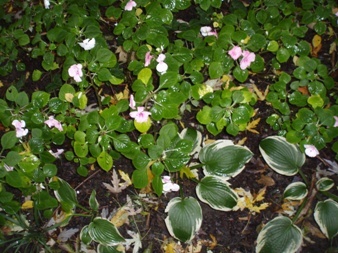 Annuals provide color all of the growing season and are important additions when a mass of color is needed for a long period of time.The variegated leaf at the bottom of the photograph is hosta, a shade-loving perennial that looks beautiful with this shade-loving annual, impatiens. Questions about Plants or any other landscape design topic? Please ask! I will respond quickly and give the topic a page on this site. You can share it with your friends and the readers will appreciate the information. I hope to be hearing from you. Please contact me for further information about my design services.